Hung over the autumn sky, sent Acacia Trinidad, the full moon! The T stage show of SBM was performed at Shibang Plaza on 7 pm., September 21, 2010. More than 200 staff of 18 teams from different departments entered for the competition. On the T stage, innovative ideas were presented at times, just like the blooming flowers. 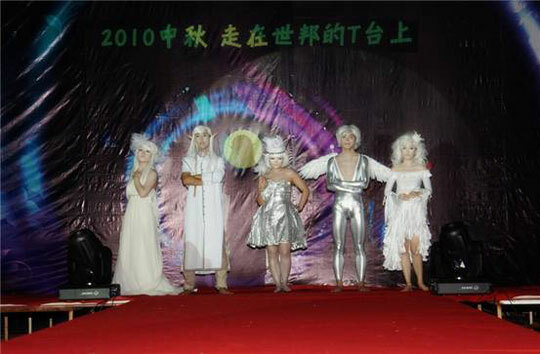 As for the performance, from the beautiful and romantic "angels and demons" to the fashionable and vigorous “DJ GaGa”, from the “Green Melody” which advocates energy-saving and environmental protection to the "Top Gun" which playbacks the World Cup elegant demeanour, all of them were praised by audience with their applause and cheers. Finally, the "DJ GaGa" was topped by by the company and obtained the reward of ten thousand yuan with their dazzling T stage show and wonderful stage play. The other teams also obtained the corresponding rich rewards. The moon is wish, the moon is regards. Gathering in Shibang, with you, with me, is equivalent to reunion.